HTC Kindle Smartphone for Amazon Prime Users? According to a report from Bloomberg, HTC is in discussions with Amazon to develop smartphones for users of its Prime streaming media service. While no final decision has been made, this does give us a hint of the strategic direction of each company. Let's take a look at the motivations and success factors for this strategy. Over the past year, HTC has struggled to compete in the high-end of the smartphone market and lacks the low overhead structure to compete in the low-end. 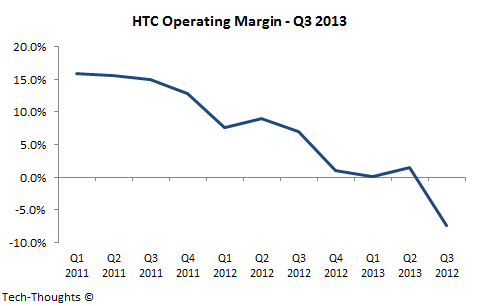 As a result, HTC's financials have continued to deteriorate and the company may be running out of options. If HTC decides to use Amazon's forked Android firmware on their devices, it risks expulsion from the Open Handset Alliance (OHA) and could lose access to critical Google services like Google Play which could be even more detrimental to its prospects. Therefore, HTC may be consider a partnership with Amazon as a last ditch effort to salvage its business. However, it is unclear how these talks could affect talks with Lenovo about "strategic cooperation". My guess is that HTC considers one of these potential partnerships to be a "Plan-B". Amazon's Motivations: Exclusivity for Amazon Prime Users? From Amazon's perspective, the motivations are quite clear. The whole point of their Kindle device is to increase revenues from their content business. As content consumption has shifted from PCs to tablets and smartphones, it made sense to increase revenue potential from those devices. The key question here is why Amazon wants to restrict sales of this hypothetical smartphone to Amazon Prime users. If Amazon's goal is to increase content revenue, wouldn't it make sense to get an Amazon smartphone into as many hands as possible? This is where pricing and competitive dynamics come into play. While Amazon's Kindle Fire strategy had a clear value proposition for users (a high quality, cost effective tablet), appealing to smartphone users is more difficult. Unlike tablet pricing, smartphone pricing is subsidized by carriers in Amazon's core markets (US/Europe). Since carriers control pricing, a smartphone OEM's direct customers are not end consumers, but the carriers themselves. Therefore, Amazon needs to offer carriers a device that generates high ARPU with a low subsidy burden - Xiaomi may follow a similar strategy to eventually enter subsidized markets. Amazon's pitch to carriers becomes much stronger if sales of their smartphone are restricted to Amazon Prime members. Media streaming would increase data usage and hence, data revenue for carriers, which would motivate them to invest in marketing Amazon's Kindle smartphones. Once penetration reaches critical mass and carrier support is certain, Amazon could always attempt to expand sales to non-Prime members. Based on this, my guess is that Amazon is likely press ahead with this strategy with or without HTC. HTC may be little more than a "carrier relationship manager" from Amazon's perspective.